MISSION CONTROL CENTER, 24 Sept - RIA Novosti. The flight engineer of the ISS Fedor Yurchikhin, who is located on board the station near the closed entrance port of the ship “Soyuz TMA-18”, discovered under the jacket of the actuator of an attachment point a broken-off gear wheel - possibly, precisely, this component prevented the regular separation of the spacecraft. The separation of the manned spacecraft “Soyuz TMA-18” with three cosmonauts aboard, planned on 05.39 Moscow Time on Friday, was postponed through technical reasons. The ship could not be unjointed from the mooring port of module “Pirs”. In Mission Control they hope that the separation can be carried out soon; however, they do not exclude the delay of this operation. On the request of Mission Control specialists, flight engineer Yurchikhin removed the jacket of the actuator of an attachment point - and revealed there the broken off gear wheel with size approximately 2 centimeters, about which he reported to Mission Control. For the cosmonaut it was possible to photograph the gear wheel with two broken teeth and during a communications tele-session he showed the photograph to specialists. It was obvious that of seven teeth on the gear wheel, two are broken in the photograph. It is possible that this faulty part was one of the reasons which impeded the opening of the undocking locks of the spacecraft “Soyuz TMA-18” from the ISS module “Pirs”. Mission Control specialists thus far give no official comments. "This object, similar to an asterisk with a hole in the middle, flew away further under the cover I do not see it, and therefore thus far I cannot reach it. 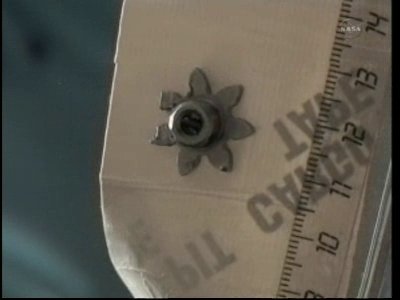 Possibly, this is a gear wheel in size not more than two centimeters" , said Yurchikhin. A few minutes ago, NASA TV was showing a replay of some downlink of a piece of a "gear mechanism" with "two broken teeth." Did you manage to capture some screenshots? Missed it as I was more focused on the comms. No, I was hoping someone here might have...but I'm sure we'll see it again if it's related to the problem. Sounds like they're going to work on opening up the hatches. CBS News post the dameged gear picture. So how does one fix something like this? I am guessing they cannot re open the hatches and reenter ISS with things the way they are now. They can and have. The problem isn't closing the MRM-2 hooks and latches, it is opening them for undocking. "For Sardines, space is no problem!" "We're rolling in the wrong direction but for the right reasons"
Thanks to all for this coverage. Very much appreciated. Remembering those who made the ultimate sacrifice for our rights & freedoms, and for those injured, visible or otherwise, in that fight. The ruler in that photo should be indicating centimeters, right? Is NASA mistranslating 'jumpers' here? The stage is set for Soyuz TMA-18 to undock from the International Space Station at 10:02 p.m. EDT Friday after overnight repairs successfully fixed a troublesome docking mechanism. Space station crew members installed a series of jumpers, bypassing a failed component that had prevented commands from being received by the Russian Poisk module's docking mechanism. Once the jumpers were in place, the Poisk module hooks and latches were successfully opened. A similar series of hooks and latches on the Soyuz side of the docking mechanism remains in place, firmly holding the spacecraft to the space station. The station crew will sleep until 2 p.m. before it begins preparations for tonight's undocking and an early Saturday landing of Expedition 24 crew members Alexander Skvortsov, Tracy Caldwell Dyson and Mikhail Kornienko. At 12:12 a.m., the Mission Control Centers in Houston and Moscow concurred on a plan to reopen the Soyuz hatches and allow Alexander Skvortsov, Tracy Caldwell Dyson and Mikhail Kornienko to reenter the station. The planned undocking was prevented when commands being sent to disengage the hooks and latches holding the Soyuz TMA-18 spacecraft failed. The spacecraft remains securely docked to the Poisk module. Engineers are continuing to troubleshoot the problem. Expedition 25 Commander Doug Wheelock and Flight Engineers Shannon Walker and Fyodor Yurchikhin sent down video and still photos of a small star-shaped gear with two broken teeth, and experts are evaluating whether the part is related to the commanding problem. Space Pete noted the manual crank used to seal the hatch cover, but I don't think the cover mechanism means the diocking mechanism itself. Perhaps this (gear) is part of the hatch cover mechanism? Is the cover critical to maintaining an airtight seal with no vehicle docked? I know, I ask a lot of questions, but such is the life of a troubleshooting engineer turned manager. Installation of electrical jumpers that mimic an expected-but-absent "hatch locked" signal in the docking mechanism of the space station's Poisk module appears to have resolved a glitch that prevented three crew members from undocking and landing early Friday, officials said. Russian press reports describe an undocking glitch the last time a vehicle left the Poisk. But date references and the claim it was Soyuz TMA-17 conflict with my own records. Can anybody identify the vehicle and date for the previous Poisk undocking, and whether any 'glitch' was disclosed at that time? Spasibo!! Well, this system has been in use on the FGB & SM for 10 years without issue. However, given that MRM-2 is a new module, I wonder if the gear was redesigned? For the teeth to have snapped off like that, I'd say the gear would have to have been put under a lot of mechanical force. The earliest that a replacement part could be flown up is aboard Soyuz TMA-01M on Oct. 8. However, with MRM-1 now permanently berthed to FGB Nadir, it may be possible to remove the obviously working gear from FGB Nadir & install it in MRM-2. That would have been Soyuz TMA-16 on March 18, 2010. Yest posadka! (We have Landing!) Welcome back home, Jeff and Max! After 169 days 4 hrs 9 min in space (167d docked to ISS), Soyuz TMA-16/20S, carrying Exp-22 crewmembers Maxim Suraev (Russia) and Jeff Williams (USA), landed successfully this morning at 7:24am EDT (local time 5:24pm) in the snow-bound steppes of southern Kazakhstan northeast of the town of Arkalyk, with the crew in excellent condition. The descent capsule toppled on its side. See photo below. [TMA-16 (#226) undocked from its MRM2 port this morning at 4:03am EDT. Before undock, the crew performed leaks checks of the vestibule area between the MRM2 and the Soyuz spacecraft, of their suits and of the hatch between the Descent Module (SA) and Orbital Module (BO). There were 3 Longeron Shadowing cautions for the ISS during the preparation for undock, but these were quickly cleared because the vehicle was in planned (verified) configuration & attitudes. The Undock command was issued at 4:00am, followed by separation at 4:03am. Is the Russian claim a garble or was there more that was unreported? Armchair Fennonaut, (Sometime) University Teacher. has anyone seen the timeline for the second attempt? To accommodate tonight's second attempt at Soyuz TMA-18/22S undocking, crew workday began at 6:00 PM GMT, after a long sleep (from 6:30 AM GMT) and ends with sleep at 5:35 AM GMT tomorrow morning. After a "sleepy" Saturday, wakeup on Sunday (26/09): 6:00 AM GMT, returning to normal. Last night, during the 22S undock attempt, the MRM-2 hooks failed to open, causing deferral of the departure to tonight after a number of troubleshooting attempts. New times are: Undocking – 1:59 PM GMT; Landing – 5:31 AM GMT. Descent timeline will change commensurably (see yesterday's status report). kept the hooks from opening. release the Soyuz side hooks. the 08/10 launch date of Soyuz TMA-01M/24S. working late to get those MRM-2 hooks open! "This was another "First"
• Activating the Soyuz at ~9:10 PM to 10:10 PM GMT. night to rigidize the connection. Wheels also will close the external protective window shutters of the Lab, JPM and Cupola in preparation for the undocking. Mikhail & FE-2 Tracy Caldwell-Dyson are to join Alexander in the Descent Module, while Alexander performs the regular communications check from 22S. Hatches will be closed by Alexander (in Soyuz) and Fyodor (in MRM-2) at ~10:30 PM to 10:50 PM GMT. The hatch closing will be covered live by photo/video as a PAO event, with FE-6 Shannon Walker in charge of video camera activation and deactivation after the event. The departing Soyuz crew then starts the standard one-hour leak checks on the Soyuz to MRM-2 vestibule and their Sokol suits. Structural dynamics measurements of the undocking will also be taken with the US IWIS (Internal Wireless Instrumentation System). • Manually close the MRM2 KVD/PEV (Pressure Equalization Valve). • Reconfigure the Russian STTS onboard comm system to its "undocked"
photo/video footage of the hatch closure event to the ground. that there was no overheating. After attitude control authority has been handed over to the RS MCS (Motion Control System) at ~1:00 AM GMT, the ISS will go into Free Drift at 1:58 PM to 2:07 PM GMT for MRM-2 hooks opening and Soyuz undocking at ~2:02 PM GMT. Attitude control will return to US CMG Momentum Management at ~3:00 AM GMT. After 22S departure, CDR Doug Wheelock will remove the 4 protective alignment guides on the T2 COLBERT treadmill. Help! Is there any one watching NASA TV off AC-3 Satellite. They changed there Audio format to AC-3. I have a Pansat 3500SD and have a great picture but NO SOUND! Dose anybody know how I can get the sound back using this recevied?